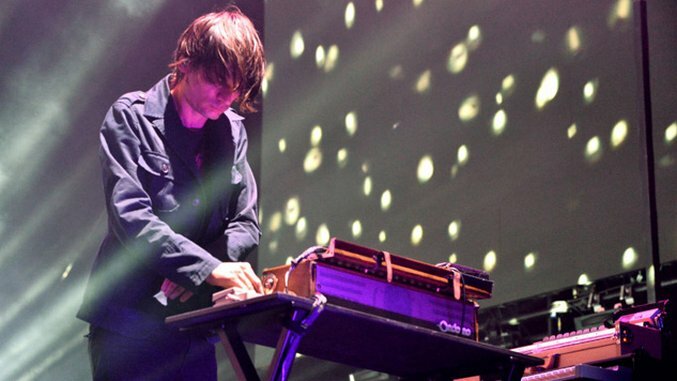 When he’s not touring the world and writing music with Radiohead as the band’s keyboardist and guitarist, Jonny Greenwood has a pretty successful side-hustle as a composer and song curator for films. Thanks to his signature style of toying with strange instruments like the ondes Martenot, Greenwood imbues his scores with a range of sounds—from the experimental and atonal to the straight ahead rock ‘n’ rollin’—in order to fit a film’s aesthetic. Radiohead only has a smattering of international tour dates this summer, but most of the films that Greenwood scored are currently streaming on Netflix. So as the heat of the summer builds, take a cool retreat back to your couch and watch these six movies with Greenwood’s best, mellifluous, orchestral and entrancing scores. Bodysong, an offbeat documentary inspired by art house films, is Greenwood’s first credit as a composer. In response to the film’s experimentalism, Greenwood’s score seems to create tapestries of orchestral sounds. Plus, he somehow manages to squeeze in his signature style guitar sound in a few tracks. Greenwood curated 18 songs for this 2011 moody psychological thriller. Working in songs by Brian Wilson and Buddy Holly alongside the Happy Days theme song and traditional music of Liu Fang, this soundtrack comprises an intense musical foreshadowing that builds up the narrative’s murderous climax. Inherent Vice , based on the book by Thomas Pynchon, is an offbeat, dark comedy-detective story about hippie detective trying to help his ex track down her new lover. Director Paul Thomas Anderson’s interpretation can be challenging to decipher due to it’s stream of consciousness styling, but Greenwood’s masterful composition and curation help with the narrative flow. As a result, the soundtrack works delivering a nostalgic mood, fitting for this late-’70s period piece. An adaptation of Haruki Murakami’s novel of the same name, Norwegian Wood tells the story of Toru Watanabe. After losing his best friend Kizuki to suicide, Watanabe bonds with Kizuki’s ex-girlfriend, Naoko. The soundtrack includes both orchestral pieces that enliven the dramatic moments of the film and songs by famed krautrock band Can, whose music gives the film an authentic ‘60’s and ‘70s feeling. Greenwood creates a tense, rich musical world that melds perfectly with Paul Thomas Anderson’s vision of L. Ron Hubbard’s life and the rise of the Church of Scientology. The score captures a sense of mystery that reflects the ambivalence of Philip Seymour Hoffman’s character, the cult leader Lancaster Dodd, and the deterioration of Joaquin Phoenix’s character, Freddie Quell. Based on Upton Sinclair’s 1920s political novel, Oil!, the Oscar-winning There Will Be Blood is probably the most famous of all of Greenwood’s work. There WIll Be Blood is a suspenseful masterpiece depicting the rise of oil tycoon Daniel Plainview (played by Daniel Day Lewis). But with Greenwood’s work, some of which was written during his residency with the BBC Orchestra, the film’s slow narrative spiral into dirty business dealings feels especially dark and twisted.